Well as you know from yesterday I did a 5x7 canvas and immediately had to start another one....and guess what, today's canvas is going to be added as a 3rd prize to my OWOH giveaway. So if you haven't already commented over there, be sure to before Friday. I covered the canvas with a K and Company scrap paper both front and back. I took a piece of brown light weight cardstock and ran it through the CB with a Music note folder from Crafts too. Before I covered it I did something to it then I painted the brown paper with some Delta Ceramcoat Timberline green. Sanded the paper to reveal the brown and it made it really weathered looking. 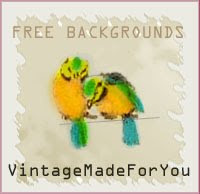 Grungy and brown and green, love those colours. 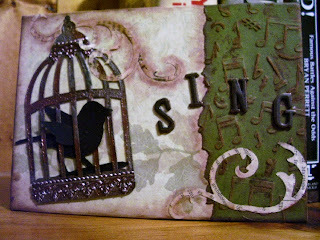 I then made another guilded bird cage and painted my bird with wings in black paint. Hubs thought I should do this so not to do too many colours, I sometimes have to ask him advice as I get carried away sometimes. Then I added a Tim Holtz flourish die cut but not sure I like the brown chalking around it, the photo here does not do it justice so I may have to touch it up with a darker brown. 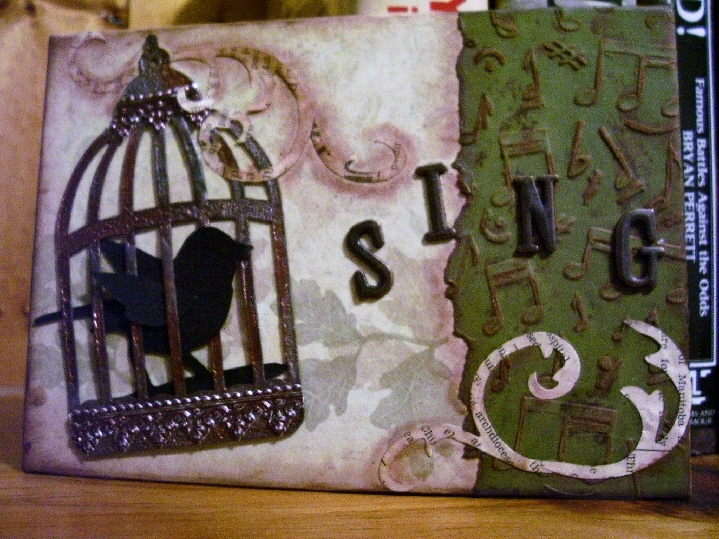 I inked the edges with Java ink and popped some brown German Scrap yes from Artchix and added some metal letters to make sing. and.....these are some transparency butterflies I learned how to make from a woman over at the group I just joined in the new year called Bella Creations. 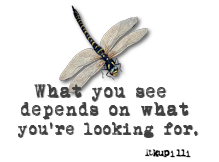 Gloria dazzled us with these butterflies of hers and gave us a YouTube link to watch. Well that is another story in itself, for a 6 and a half minute tut it took me over 2 hours to download on dial up speed. Needless to say it was worth it but I won't be watching many vids any time soon. Good grief. Well here they are, transparency butterflies, you can either stamp them with Stazon or print them off from the web, I did both as some butterfly stamps are too detailed to see colours. Then you apply alcohol inks to the opposite side of the print or stamping so you don't mess up the ink. 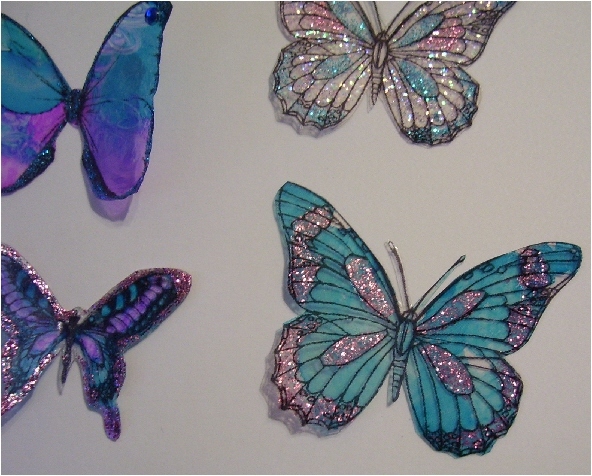 Add Stickles some pretty gems, cut out and you have butterflies in an array of colours. Mix your colours or just one, add some glitter before you ink them and create a different look like I did. They are a lot of fun, nice to have in your stash for when you need something to embellish a card with. If you don't have inkjet transparencies you can use plastic packaging and stamp on it. Find ways to recycle and create with what you have. Thanks for looking and I have so enjoyed all the lovely comments during OWOH. I am still travelling but I sure am struggling trying to get to all of them. There are not enough hours in the day.